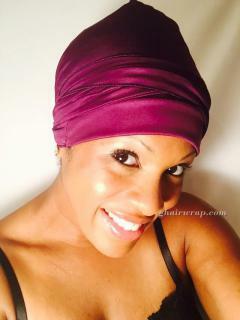 Soft silky charmuese(satin) patented hair bonnet with Lycra stretch lace front or same fabric band. Large bouffant style bonnet won't flatten your curls. Fabric is lightweight and ooh so comfortable! The drawstring in back along with the banded front design means that you can size it to fit you individually (adjustable to fit from child to adult). It won't fall off,and won't stretch out after only a few uses. 100% polyester. Washable, delicate. Ships in 1-2 business days via US Postal Service.